Evidence suggests that a diet high in fruits and vegetables may decrease the risk of chronic diseases, such as cardiovascular disease and cancer, and phytochemicals including phenolics, flavonoids and carotenoids from fruits and vegetables may play a key role in reducing chronic disease risk. Apples are a widely consumed, rich source of phytochemicals, and epidemiological studies have linked the consumption of apples with reduced risk of some cancers, cardiovascular disease, asthma, and diabetes. In the laboratory, apples have been found to have very strong antioxidant activity, inhibit cancer cell proliferation, decrease lipid oxidation, and lower cholesterol. Apples contain a variety of phytochemicals, including quercetin, catechin, phloridzin and chlorogenic acid, all of which are strong antioxidants. The phytochemical composition of apples varies greatly between different varieties of apples, and there are also small changes in phytochemicals during the maturation and ripening of the fruit. Storage has little to no effect on apple phytochemicals, but processing can greatly affect apple phytochemicals. While extensive research exists, a literature review of the health benefits of apples and their phytochemicals has not been compiled to summarize this work. The purpose of this paper is to review the most recent literature regarding the health benefits of apples and their phytochemicals, phytochemical bioavailability and antioxidant behavior, and the effects of variety, ripening, storage and processing on apple phytochemicals. In the United States, as well as in most industrialized countries, cardiovascular disease and cancer are ranked as the top two leading causes of death. The causes of both diseases have been linked to lifestyle choices, and one of the most important is diet. It has been estimated that a healthy diet could prevent approximately 30% of all cancers [1, 2]. High cholesterol and obesity are greatly influenced by diet and lifestyle and are costing the United States billions of dollars in health related expenses. High cholesterol, a risk factor for cardiovascular disease, is commonly treated with statin drugs, and it has been estimated that the United States will spend 30 billion dollars per year on cholesterol treatment by statin drugs . In 1998, obesity, a risk factor for cardiovascular disease, cancer, and diabetes, has been estimated to cost the United States over 92 billion dollars per year . Understanding the effects of diet on chronic disease may greatly aid in the prevention of chronic disease. As children, many of us were told to "eat your vegetables because they are good for you", and the adage "an apple a day keeps the doctor away" is still quite popular. Recently, many studies have provided the scientific backing for both of these very common phrases. In the early 1990's, researchers examined well over one hundred epidemiological studies relating to diet and cancer, and in 128 of 156 dietary studies, fruits and vegetables had a significant protective effect against a variety of different cancers . They found that those who consumed low amounts of fruits and vegetables were twice as likely to have cancer compared to those who ate high amounts of fruits and vegetables. Recently, a study linked intake of fruits and vegetables with a reduced risk in breast cancer in woman in China . In this population based, case-control study of women in Shanghai, pre-menopausal women who ate more dark yellow-orange vegetables and more citrus fruits tended to have lower breast cancer risk. Fruit and vegetable intake also appears to have a protective effect against coronary heart disease . Approximately 84,000 women were followed for 14 years and 42,000 men were followed for 8 years. They found that people who ate the highest amount of fruits and vegetables had a 20% lower risk for coronary heart disease, and the lowest risks were seen in people who consumed more green leafy vegetables, and fruits rich in vitamin C. Not only may a diet high in fruits and vegetables help prevent heart disease and cancer, but it may also help protect against a variety of other illnesses. For example, a diet high in fruits and vegetables may help protect against cataracts, diabetes, Alzheimer disease, and even asthma [8–10]. Much of the protective effect of fruits and vegetables has been attributed to phytochemicals, which are the non-nutrient plant compounds such as the carotenoids, flavonoids, isoflavonoids, and phenolic acids. Thousands of phytochemicals have been identified in foods, yet there are still many that have not been identified. Different phytochemicals have been found to possess a range of activities, which may help in protecting against chronic disease. For example, phytochemicals may inhibit cancer cell proliferation, regulate inflammatory and immune response, and protect against lipid oxidation [11, 12]. A major role of the phytochemicals is protection against oxidation. We live in a highly oxidative environment, and many processes involved in metabolism may result in the production of more oxidants. Humans, and all animals, have complex antioxidant defense systems, but they are not perfect and oxidative damage will occur. Both cardiovascular disease and cancer are thought to be particularly the results of oxidative stress, which can lead to damage of the larger biomolecules, such as DNA, lipids, and proteins. It has been estimated that there are 10,000 oxidative hits to DNA per cell per day in humans . A major class of phytochemicals found commonly in fruits and vegetables are the flavonoids. Apples are a very significant source of flavonoids in people's diet in the US and in Europe. In the United States, twenty-two percent of the phenolics consumed from fruits are from apples making them the largest source of phenolics . In Finland, apples and onions are main sources of dietary flavonoids, while in the Netherlands apples rank third behind tea and onions as top sources of flavonoids [14, 15]. In a Finnish study of approximately 10,000 people, flavonoid intake was associated with a lower total mortality . Apples were one of the main sources of dietary flavonoids that showed the strongest associations with decreased mortality. Not only are apples commonly enjoyed by many cultures, but they are also a good source of antioxidants. 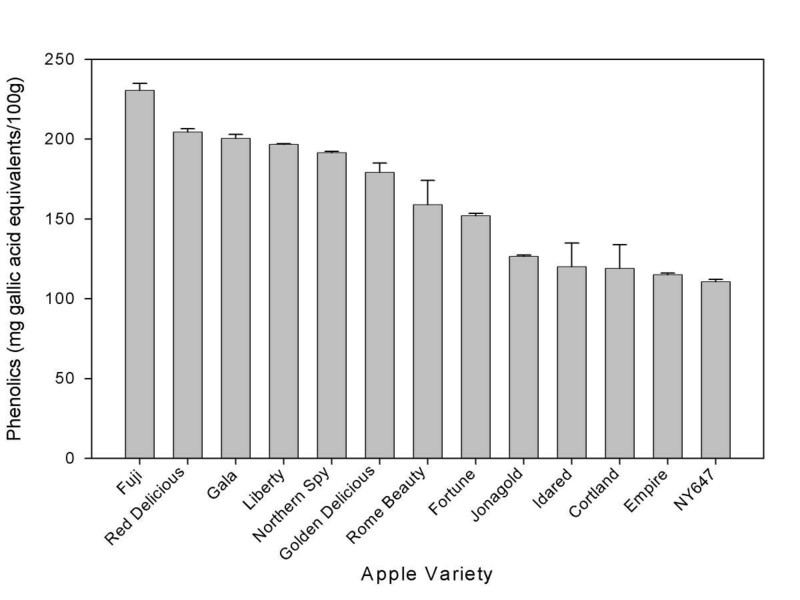 When compared to many other commonly consumed fruits in the United States, apples had the second highest level of antioxidant activity (Figure 1). Apples also ranked the second for total concentration of phenolic compounds, and perhaps more importantly, apples had the highest portion of free phenolics when compared to other fruits . This means that these compounds are not bound to other compounds in the fruits, and the phenolics may be more available for eventual absorption into the bloodstream. Antioxidant activity of various fruit extracts (mean ± SD, n = 3). Since fruits and vegetables are high in antioxidants, a diet high in these foods should help prevent oxidative stress, and may therefore help prevent chronic disease and slow aging. These findings have lead to the National Research Council to recommend consuming five or more servings of fruits and vegetables a day. Several commonly consumed foods and beverages, including tea, wine, onions, cocoa, cranberries, and apples, have been targeted as particularly beneficial in the diet because of their high content of phenolic compounds. While active research into the health benefits of these foods has been ongoing, current reviews of this work exist for all of the above-mentioned foods except apples. Therefore, the purpose of this paper is to review the recent literature addressing the health benefits of apples, their phytochemical profile, bioavailability of apple phytochemicals, and factors that may affect the phytochemical quality, such as apple variety, ripening, storage, and processing. Several studies have specifically linked apple consumption with a reduced risk for cancer, especially lung cancer. In the Nurses' Health Study and the Health Professionals' Follow-up Study, involving over 77,000 women and 47, 000 men, fruit and vegetable intake was associated with a 21% reduced risk in lung cancer risk in women, but this association was not seen in men . Very few of the individual fruits and vegetables examined had a significant effect on lung cancer risk in women, however apples were one of the individual fruits associated with a decreased risk in lung cancer. Women who consumed at least one serving per day of apples and pears had a reduced risk of lung cancer . Of the men involved, there was no association seen between any individual fruit or vegetable and lung cancer risk. In a case control study in Hawaii, it was found that apple and onion intake was associated with a reduced risk of lung cancer in both males and females . Smoking history and food intake was assessed for 582 patients with lung cancer and 582 control subjects without lung cancer. There was a 40–50% decreased risk in lung cancer in participants with the highest intake of apples, onions, and white grapefruit when compared to those who consumed the lowest amount of these fruits. The decreased risk in lung cancer was seen in both men and women and in almost all ethnic groups. No associations were seen with red wine, black tea or green tea. Both onions and apples are high in flavonoids, especially quercetin and quercetin conjugates . Le Marchand et al. found an inverse association between lung cancer and quercetin intake although the trend was not statistically significant. Interestingly, the inverse association seen between apple and onion intake and lung cancer were stronger for squamous cell carcinomas than for adenocarcinomas. In a Finnish study involving 10,000 men and women and a 24-year follow-up, a strong inverse association was seen between flavonoid intake and lung cancer development . In the sampled population, the mean flavonoid intake was 4.0 mg per day, and 95% of the total flavonoid intake was quercetin. Apples and onions together provided 64% of all flavonoid intake. The reduced risk of lung cancer associated with increased flavonoid consumption was especially strong in younger people and in nonsmokers. Apples were the only specific foods that were inversely related to lung cancer risk. Since apples were the main source of flavonoids in the Finnish population, it was concluded that the flavonoids from apples were most likely responsible for the decreased risk in lung cancer. The relationship of dietary catechins and epithelial cancer was examined in 728 men (aged 65–84) as part of the Zutphen Elderly Study . Tea, a naturally high source of catechins, contributed 87% of the total catechin intake in this study, while apples contributed 8.0% of catechin consumption. It was found that total catechin and tea consumption did not have an effect on lung cancer, but apple consumption was associated with decreased epithelial lung cancer incidence . This supported the findings of the previous studies discussed, where apples were significantly inversely associated with lung cancer, and may suggest that catechins alone do not play have a effect against lung cancers. Other data from the Zutphen Elderly study showed an inverse association between fruit and vegetable flavonoids and total cancer incidence and tumors of the alimentary and respiratory tract . Again, tea flavonoids were not associated with a decrease in cancer risk. A reduced risk of cardiovascular disease has been associated with apple consumption. The Women's Health Study surveyed nearly 40,000 women with a 6.9-year follow-up, and examined the association between flavonoids and cardiovascular disease . Women ingesting the highest amounts of flavonoids had a 35% reduction in risk of cardiovascular events. Flavonoid intake was not associated with risk of stroke, myocardial infarction, or cardiovascular disease death. Quercetin did not have any association with cardiovascular disease, cardiovascular events, myocardial infarction or stroke. However, both apple intake and broccoli intake were associated with reductions in the risk of both cardiovascular disease and cardiovascular events. Women ingesting apples had a 13–22% decrease in cardiovascular disease risk. In a Finnish study examining flavonoid intake and coronary mortality, it was found that total flavonoid intake was significantly inversely associated with coronary mortality in women, but not in men . Apple and onion intake was also inversely associated with coronary mortality, especially in women. Data collected from this same cohort study also showed the effect of quercetin and apple intake on cerebrovascular disease . Those who had the highest consumption of apples had a lower risk of thrombotic stroke compared to those who consumed the lowest amounts of apples . Onion intake and quercetin intake were not associated with thrombotic stroke or other cerebrovascular diseases. Apple and wine consumption was also inversely associated with death from coronary heart disease in postmenopausal women in a study of nearly 35,000 women in Iowa . The intakes of catechin and epicatechin, both constituents of apples, were strongly inversely associated with coronary heart disease death. Although total catechin intake was inversely associated with coronary heart disease mortality, Arts et al (2001) found that tea catechins were not associated with coronary heart disease mortality in postmenopausal women. Apple catechins may be more bioavailable than the catechin and epicatechin gallates commonly found in teas. The relationship between flavonoids and risk of coronary heart disease were also examined as part of the Zutphen Elderly Study . Flavonoid intake was strongly correlated with a decreased mortality from heart disease in elderly men and also negatively correlated with myocardial infarction. Tea was the main source of flavonoids in this study and was also negatively correlated with coronary heart disease. Apple intake contributed to approximately 10% of the total ingested flavonoids and was also associated with a reduced risk of death from coronary heart disease in men, however the relationship was not statistically significant . Apple consumption has been inversely linked with asthma and has also been positively associated with general pulmonary health. In a recent study involving 1600 adults in Australia, apple and pear intake was associated with a decreased risk of asthma and a decrease in bronchial hypersensitivity, but total fruit and vegetable intake was not associated with asthma risk or severity . Specific antioxidants, such as vitamin E, vitamin C, retinol, and β-carotene, were not associated with asthma or bronchial hypersensitivity. Previously it had been found that apple intake, as well as selenium intake, was associated with less asthma in adults in the United Kingdom . This study surveyed nearly 600 individuals with asthma and 900 individuals without asthma about their diet and lifestyle. Total fruit and vegetable intake was weakly associated with asthma, and apple intake showed a stronger inverse relationship with asthma. This latter effect was most clear in subjects who consumed at least two apples per week. Onion, tea, and red wine consumption were not related to asthma incidence, suggesting an especially beneficial effect of apple flavonoids. Vitamin C and vitamin E were not correlated with asthma incidence, and carotene intake was weakly, but positively, associated with asthma. Apple intake and orange intake were both associated with a reduced incidence of asthma in the Finnish study involving 10, 000 men and women . Flavonoid intake in general was associated with a lower risk of asthma, and the association was attributed mainly to quercetin, hesperitin, and naringenin. Other fruits and vegetables, such as onions, grapefruit, white cabbage, and juices, were not associated with a decreased risk in asthma. In a study of over 13,000 adults in the Netherlands, it was found that apples might beneficially affect lung function . Apple and pear intake was positively associated with pulmonary function and negatively associated with chronic obstructive pulmonary disease. Catechin intake was also associated with pulmonary function and negatively associated with chronic obstructive pulmonary disease, but there was no association between tea, the main source of catechins, and chronic obstructive pulmonary disease . A study of approximately 2500 middle aged (45–59 yrs) Welsh men also demonstrated a beneficial effect of apple consumption on lung function . Lung function was measured as forced expiratory volume (FEV) in one second, and was positively correlated with citrus fruit, fruit juice/squash, and apple consumption. However, the association with citrus fruit and fruit juice/squash lost significance after adjustment for smoking. Apple consumption remained positively correlated with lung function after taking into account possible confounders such as smoking, body mass index, social class, and exercise. Participants who consumed five or more apples per week had a significantly greater FEV of 138 mL when compared to those who did not consume apples . Not only may apples help decrease the risk of heart disease, cancer, and asthma, but apple consumption may also be associated with a lower risk for diabetes. In the previously discussed Finnish study of 10,000 people, a reduced risk of Type II diabetes was associated with apple consumption . Higher quercetin intake, a major component of apple peels, was also associated with a decreased risk in type II diabetes. Myrectin and berry intake were also associated with a decreased risk in type II diabetes, but onion, orange, grapefruit and white cabbage intake were not associated with a lowered risk. Apple and pear intake has also been associated with weight loss in middle aged overweight women in Brazil . Approximately 400 hypercholestemic, but nonsmoking, women were randomized to one of three supplement groups: oat cookies, apples or pears, and each subject consumed one of each supplement three times per day for twelve weeks. The participants who consumed either of the fruits had a significant weight loss after 12 weeks of 1.21 kg, whereas those consuming the oat cookies did not have a significant weight loss. Those consuming fruit also had a significantly lower blood glucose level when compared to those consuming the oat cookies . Apples, and especially apple peels, have been found to have a potent antioxidant activity and can greatly inhibit the growth of liver cancer and colon cancer cells [31, 32]. The total antioxidant activity of apples with the peel was approximately 83 μmol vitamin C equivalents, which means that the antioxidant activity of 100 g apples (about one serving of apple) is equivalent to about 1500 mg of vitamin C. However, the amount of vitamin C in 100 g of apples is only about 5.7 mg . Vitamin C is a powerful antioxidant, but this research shows that nearly all of the antioxidant activity from apples comes from a variety of other compounds. Vitamin C in apples contributed less than 0.4% of total antioxidant activity. Apples have been shown to have potent antiproliferative activity in several studies. When Caco-2 colon cancer cells were treated with apple extracts, cell proliferation was inhibited in a dose-dependent manner reaching a maximum inhibition of 43% at a dose of 50 mg/mL. The same trend was seen in Hep G2 liver cancer cells with maximal inhibition reaching 57% at a dose of 50 mg/mL . Eberhardt et al. proposed that it is the unique combination of phytochemicals in the apples that are responsible for inhibiting the growth of tumor cells. Apples had the third highest antiproliferative activity when compared to eleven other commonly consumed fruits . Different varieties of apples had different effects on liver cancer cell proliferation . At a dose of 50 mg/mL, Fuji apple extracts inhibited Hep G2 cell proliferation by 39% and Red Delicious extracts inhibited cell proliferation by 57%. Northern Spy apples had no effect on cell proliferation . Apples without peels were significantly less effective in inhibiting Hep G2 cell proliferation when compared to apples with the peel, suggesting that apple peels possess significant antiproliferative activity. Wolfe et al. demonstrated that apple peels alone inhibited Hep G2 cell proliferation significantly more than whole apples. For example, apple peels from Idared apples had an EC50 of 13.6 mg/mL whereas the whole apple had an EC50 of 125.1 mg/mL. The EC50 refers to the dose of the apple that is required to inhibit cell proliferation by 50%. There has been some concern that apple antioxidants do not directly inhibit tumor cell proliferation, but instead they indirectly inhibit cell proliferation by generating H2O2 in reaction with the cell culture media . However, more recently it has been reported that apple extracts did not generate H2O2 formation in WME, DMEM, or DMEM/Ham F12 media, and H2O2 addition to culture medium did not inhibit Hep G2 cell proliferation or Caco-2 colon cancer cell proliferation . Additionally, the addition of catalase did not block the antiproliferative activity of apple extracts. Addition of apple phenolics to human serum decreased diphenylhexatriene-labeled phosphatidylcholine (DPHPC) oxidation in a dose dependent manner . DPHPC is incorporated into low-density lipoprotein (LDL), high-density lipoprotein and very low-density lipoprotein (VLDL) fractions and is an indicator of oxidation. Apple ingestion led to a decrease in DPHPC oxidation, reflecting the apples antioxidant activity in vivo . The protective effects of apples on LDL oxidation reached its peak at three hours following apple consumption and returned to baseline levels by 24 hours . Diphenylhexatriene labeled propionic acid (DPHPA) binds to serum albumin and is a good measure of oxidation within the aqueous phase of human serum. Mayer et al. (2001) also found that consumption of apples also led to a decrease in albumin DPHPA oxidation, reaching peak activity at 3 hours. Although apple juice typically contains less phenolics than whole apples, it is still a widely consumed source of dietary antioxidants. Pearson et al  examined the effects of six commercial apple juices and Red Delicious apples (whole apples, peels alone, and flesh alone) on human LDL oxidation in vitro. LDL oxidation was measured using headspace analysis of hexanal produced from copper-induced lipid oxidation in vitro. The dose of the apple juices and whole apple, apple peel and apple flesh, were standardized for gallic acid equivalents, and each LDL solution was treated with 5 μM gallic acid equivalents for each apple sample. LDL oxidation inhibition varied greatly between brands of fruit juice, ranging from 9 to 34% inhibition and whole apples inhibited LDL oxidation by 34%. Apple peels inhibited LDL oxidation by 34%, while the flesh alone showed significantly less inhibition (21%) . Rats fed apple juice also had a decreased level of malondialdehyde (MDA), a marker of lipid peroxidation . Quercetin, a major flavonoid in apples, had no effect on lipid oxidation when ingested by rats, suggesting that quercetin alone is not responsible for the apple's ability to inhibit lipid oxidation . Other antioxidants and the interaction between the different apple antioxidants, including quercetin, may contribute to the antioxidant activity of apples. The effect of apple juice on lipid oxidation has also been examined in vivo in human subjects. In a study involving four women and one man, ingestion of high levels of a 1:1 mixture of apple juice and black currant juice increased the antioxidant status of the blood and decreased lipid oxidation . Glutathione peroxidase also increased in humans consuming apple juice. Plasma MDA decreased over the seven-day intervention period when the subjects ingested the highest dose of the apple juice and black currant mixture (1500 mL). Despite the antioxidant effect on lipoproteins, apple juice intake had a pro-oxidant effect on plasma proteins in both humans and rats [38, 39]. Some of the apple's protective effect against cardiovascular disease may come from its potential cholesterol-lowering ability. Aprikian et al. (2001) found that when cholesterol fed rats were supplemented with lyophilized apples, there was a significant drop in plasma cholesterol and liver cholesterols and an increase in high-density lipoproteins (HDL). Furthermore, they found that cholesterol excretion increased in the feces of rats fed apples, suggesting reduced cholesterol absorption . In a second study, a similar cholesterol lowering effect was seen in cholesterol fed rats when rats were fed apples, pears, and peaches. Apples had a greater cholesterol lowering affect than the other two fruits . The three fruits also increased the plasma antioxidant potential, with apple having the greatest effect . Apples, pears, and peaches all had similar fiber content, but apples contained more phenolic compounds suggesting that perhaps the phenolics in apples contribute to this effect . In obese Zucker rats, apple consumption lowered cholesterol and low-density lipoproteins (LDL), however in lean rats, apple consumption did not change cholesterol levels . In rats supplemented with cholesterol, apple pomace fiber and sugar beet fiber, the plasma lipids were significantly lower than in rats without the dietary fiber . Rats fed sugar beet pulp fiber and apple pomace fiber, but not fed cholesterol, had no change in lipids, suggesting that these sources of dietary fiber have hypolipidemic effects only in rats fed cholesterol . The sugar beet pulp fiber and the apple pomace fiber did not have an effect of lipid peroxides. Aprikian et al. in more recent studies, found that combined apple pectin and apple phenolic fractions lowered plasma and liver cholesterol, triglycerides, and apparent cholesterol absorption to a much greater extent than either apple pectin alone or apple phenolics alone . This work suggests that there is a beneficial interaction between fruit fiber and polyphenolic components and also supports the benefits of eating whole fruits as opposed to dietary supplements. Aside from chronic disease, apples may be used to help combat other prevalent disease in the world. Recently it has been found that crude extracts from immature apples actually inhibited enzymatic activities of cholera toxin in a dose dependent manner . Additionally, apple extract reduced cholera toxin induced fluid accumulation in a dose dependent manner . The apple extracts were fractionated and each fraction was tested for inhibitory action on enzymatic activities of cholera toxin. The two apple extract fractions that contained highly polymerized catechins inhibited cholera toxin catalyzed ADP-ribosylation by 95% and 98%. The fraction containing non-catechin polyphenols caused only 3.5% inhibition and the fraction containing monomeric, dimeric, and trimeric catechins caused 39% inhibition . Overall, the animal studies and in vitro work begin to define mechanisms by which apples may help prevent chronic disease. First, the strong antioxidant activity of apples may help prevent lipid and DNA oxidation. Cancer cell culture work has demonstrated that apples inhibit cell proliferation in vitro, which may contribute to the association of apple intake with decreased cancer risk. Apples significantly lowered lipid oxidation both in humans and rats and lowered cholesterol in humans. These effects, which may be attributed to both the phenolics and the dietary fiber found in apples, may partially explain the inverse association of apple intake and risk of cardiovascular disease. Apples contain a large concentration of flavonoids, as well as a variety of other phytochemicals, and the concentration of these phytochemicals may depend on many factors, such as cultivar of the apple, harvest and storage of the apples, and processing of the apples. The concentration of phytochemicals also varies greatly between the apple peels and the apple flesh. Some of the most well studied antioxidant compounds in apples include quercetin-3-galactoside, quercetin-3-glucoside, quercetin-3-rhamnoside, catechin, epicatechin, procyanidin, cyanidin-3-galactoside, coumaric acid, chlorogenic acid, gallic acid, and phloridzin (Figure 2). Recently researchers have examined the average concentrations of the major phenolic compounds in six cultivars of apples. They found that the average phenolic concentrations among the six cultivars were: quercetin glycosides, 13.2 mg/100 g fruit; vitamin C, 12.8 mg/100 g fruit; procyanidin B, 9.35 mg/100 g fruit; chlorogenic acid, 9.02 mg/100 g fruit; epicatechin, 8.65 mg/100 g fruit; and phloretin glycosides, 5.59 mg/100 g fruit . Structures of selected apple antioxidants. The compounds most commonly found in apple peels consist of the procyanidins, catechin, epicatechin, chlorogenic acid, phloridzin, and the quercetin conjugates. In the apple flesh, there is some catechin, procyanidin, epicatechin, and phloridzin, but these compounds are found in much lower concentrations than in the peels. Quercetin conjugates are found exclusively in the peel of the apples. Chlorogenic acid tends to be higher in the flesh than in the peel . Because the apple peels contain more antioxidant compounds, especially quercetin, apple peels may have higher antioxidant activity and higher bioactivity than the apple flesh. Research showed that apples without the peels had less antioxidant activity than apples with the peels. Apples with the peels were also better able to inhibit cancer cell proliferation when compared to apples without the peels . More recent work has shown that apple peels contain anywhere from two to six times (depending on the variety) more phenolic compounds than in the flesh, and two to three times more flavonoids in the peels when compared to the flesh. The antioxidant activity of these peels was also much greater, ranging from two to six times greater in the peels when compared to the flesh, depending on the variety of the apple . This work is supported by Leontowicz et al  who found that rats consuming apple peels showed greater inhibition of lipid peroxidation and greater plasma antioxidant capacity when compared to rats fed apple flesh. Many of these phytochemicals from apples have been widely studied, and many potential health benefits have been attributed to these specific phytochemicals. The procyanidins, epicatechin and catechin, have strong antioxidant activity and have been found to inhibit low density lipoprotein (LDL) oxidation in vitro . In mice, catechin inhibits intestinal tumor formation and delays tumors onset [50, 51]. Sawa et al. (1999) found that chlorogenic acid has very high alkyl peroxyl radical (ROO•) scavenging activity. Compared to about 18 other antioxidant compounds (including quercetin, gallic acid, α-tocopherol), chlorogenic was second only to rutin . Since ROO• may enhance tumor promotion and carcinogenesis, chlorogenic acid may add to the protective effect of apples against cancer. Chlorogenic acid has been found to inhibit 8-dehydroxy-deoxyguanosine formation in cellular DNA in a rat model following treatment with 4-nitroquinoline-1-oxide . Quercetin is also a strong antioxidant, and is thought to have potential protective effects against both cancer and heart disease. Briefly, quercetin has been found to down regulate expression of mutant p53 in breast cancer cells, arrest human leukemic T-cells in G1, inhibit tyrosine kinase, and inhibit heat shock proteins . Quercetin has protected Caco-2 cells from lipid peroxidation induced by hydrogen peroxide and Fe2+ . In mice liver treated with ethanol, quercetin decreased lipid oxidation and increased glutathione, protecting the liver from oxidative damage . Recently, it has been found that high doses of quercetin inhibit cell proliferation in colon carcinoma cell lines and in mammary adenocarcinoma cell lines, but at low doses quercetin increased cell proliferation (20% in colon cancer cells and 100% in breast cancer cells) . However, low doses of quercetin (10 uM) inhibited cell proliferation in Mol-4 Human Leukemia cells and also induced apoptosis . Quercetin inhibited intestinal tumor growth in mice, but not in rats. Low levels of quercetin inhibited platelet aggregation, calcium mobilization, and tyrosine protein phosphorylation in platelets . Modulation of platelet activity may help prevent cardiovascular disease. Both animal and cell culture studies show that there is an association between the polyphenolic compounds found within apples and a wide variety of effects that may help prevent chronic disease. This supports the hypothesis that it is the phytochemicals found in fruits, especially apples, that impart healthy benefits. More research is still needed to clarify the effects of these compounds in vivo. In order to examine the effects of these compounds in vivo, it is necessary to understand the bioavailability of the specific compounds, and the bioavailability of these compounds within the fruit matrix. As the link between diet and chronic disease grows stronger, many are working to understand how phytochemicals may provide health benefits. An important question to be asked is: Are these phytochemicals bioavailable? Concentrations and bioavailability of phytochemicals are important issues to evaluate when characterizing the effects of dietary phytochemicals on human health. To this date, little literature exists that addresses the bioavailability of phytochemicals from whole foods, including the apple. One of the few studies addressing bioavailability from apples or apple products looks at the bioavailability of polyphenolic compounds from alcoholic apple cider in humans . After drinking 1.1 liters of apple cider, no quercetin was found in the volunteers' plasma. Instead, low levels of 3'-methyl quercetin and 4'-methyl quercetin were seen within 60 minutes following consumption of the cider. Caffeic acid was rapidly absorbed, but within 90 minutes the caffeic levels in the plasma were undetectable. Catechin, epicatechin, and phlorizin were not seen in the plasma, possibly because the concentration in the cider was too low. Hippuric acid and phloretin were both increased in the subjects' urine following the consumption of the cider, but there was no evidence of quercetin, catechin, or epicatechin in the urine . In another study involving human subjects, quercetin bioavailability from apples was only 30% of the bioavailability of quercetin from onions . In this study, quercetin levels reached a peak after 2.5 hours in the plasma, however the compounds were hydrolyzed prior to analysis, so the extent of quercetin conjugation in the plasma is unknown. The bioavailability differences between apples and onions most likely are from the differences in quercetin conjugates in the different foods. Onions contain more quercetin aglycone and more quercetin glucosides, whereas apples tend to contain more quercetin monoglycosides and quercetin rutinoside, which may be less bioavailable. Our lab has examined the bioavailability of both quercetin and quercetin-3-glucoside from apple peel extracts and onion extracts in Caco-2 cells. Apple peel extracts contained no free quercetin, and no quercetin accumulation was seen in the Caco-2 cells following incubation with apple peel extract. Low amounts of quercetin-3-glucoside were absorbed by the cells (4%). However, onions contain some free quercetin and greater amounts of quercetin glucosides, and the absorption of quercetin into the Caco-2 cells from onion extracts was much greater than from apple extracts. The above results can be explained by recent research examining quercetin and quercetin glycoside bioavailability. In a study by Walle et al. , it was found that, in the ileostomy fluid, quercetin primarily existed as the aglycone form. The group hypothesized that β-glucosidases hydrolyzed quercetin glucosides to quercetin, which could be then passively transported . In support of this theory, Day et al. determined that quercetin glycosides were mainly deglycosylated by lactase phlorizin hydrolase before the aglycone then passed into the cell. Some intact glycoside transport by SGLT1 occurred and the glucosides were deglycosylated within the cell by cytosolic β-glucosidase. Quercetin-3-glucoside appeared to utilize only the lactase phlorizin hydrolase pathway, not the SLGT1 transporter, but quercetin-4-glucoside used both pathways . Apples contain some quercetin-3-glucoside that, following hydrolysis by LPH, would be available for uptake by intestinal cells. However, apples also contain other conjugates such as quercetin rhamnosides, quercetin xylosides, and quercetin galactosides that are not easily hydrolyzed by lactase phlorizin hydrolase, and most likely are not readily absorbed by small intestinal cells. In comparison, the quercetin in onions is almost all in the form of quercetin glucosides and free quercetin, making it more bioavailable to small intestinal cells. Some bacterial degradation of quercetin conjugates most likely occurs in the human intestinal tract. Enterococcus casseliflavis and Eubacterium ramulus, microorganisms isolated from human feces, were both found to degrade quercetin-3-glucoside as a carbon and energy source . Enterococcus casseliflavis utilized only the sugar moiety of the glucoside, whereas Eubacterium ramulus was also capable of degrading the aromatic ring system with phloroglucinol produced as an intermediate . Phloridzin, the glucoside conjugate of phloretin, is the major dihydrochalcone found in apples. Similarly to quercetin glucosides, phloridzin is thought to be hydrolyzed by lactase phloridzin hydrolase, and phloretin aglycone is taken up by the intestinal cells. When rats were fed phloridzin and phloretin, their plasma contained glucuronidated and sulfated phloretin but no phloridzin . This supports the theory that phloridzin is hydrolyzed prior to uptake and further glucuronidation by intestinal epithelial cells. Phloridzin is known to be a potent SGLT1 inhibitor, but recently it has been discovered that phloridzin is also transported by SGLT1 . However, phloridzin, as well as other flavonoid glucosides such as quercetin glucoside, is also effluxed by the multi-drug resistance protein (MRP1) . In human ileostomy subjects, chlorogenic acid absorption was approximately 33%, and only traces of chlorogenic acid was found in the urine . The majority of chlorogenic acid will reach the large intestine and may be metabolized by the gut microflora. Gonthier et al (2003) found that rats fed chlorogenic acid excrete very little chlorogenic acid in their urine, but instead they excrete mainly microbial produced metabolites of chlorogenic acid, such as hippuric acid and m-coumaric acid . A more recent study by Olthof et al (2003) involving human subjects showed that half of the ingested chlorogenic acid was converted to hippuric acid in the colon, most likely by microbial metabolism . Catechin and epicatechin are both absorbed by small intestinal epithelial cells . In contrast to quercetin, epicatechin was not glucuronidated by human liver microsomes, nor was it glucuronidated by human small intestinal or large intestinal tissue . Both liver and intestinal tissues contain UDP-glucuronosyltransferases (UGT) that are involved in the glucuronidation of various other flavonoids. 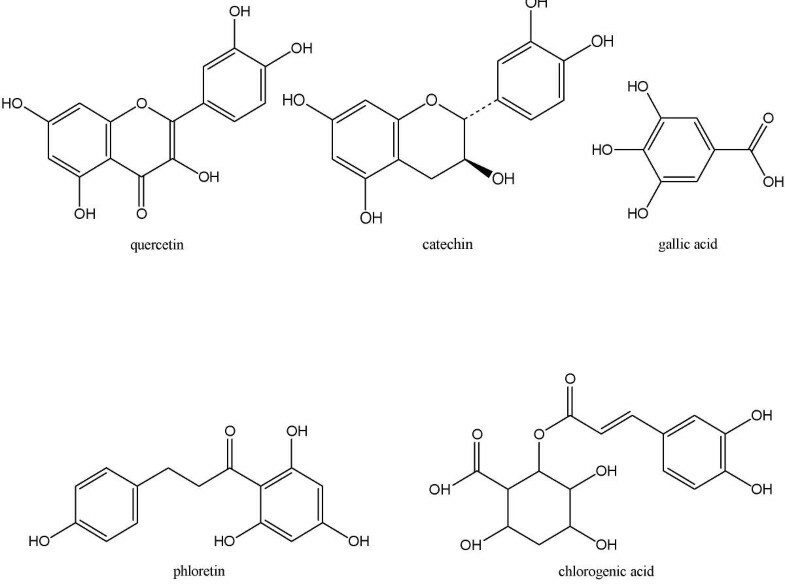 Epicatechin was found to be sulfated by the human liver and intestinal cytosols, indicating that sulfation is the major metabolic pathway for epicatechin metabolism . The mechanisms concerning the bioavailability of specific apple phytochemicals are becoming clearer as bioavailability research increases. In general, many flavonoid aglycones tend to pass through the intestinal epithelial cells where they are further conjugated. The flavonoid glycosides may be absorbed in small amounts, but most absorption seems to occur following hydrolysis by intestinal hydrolases such as lactase phloridzin hydrolase. Upon absorption these compounds are also conjugated. More research is still needed to understand the bioavailability of compounds from whole foods. The effects of the food matrix, interactions between compounds, digestion and processing on bioavailability of apple phytochemicals are still unknown. Researchers in our lab have found distinct differences in total phenolic and total flavonoid content between different apple varieties. Of four common varieties used for applesauce (Rome Beauty, Idared, Cortland, and Golden Delicious), Rome Beauty had the highest phenolic content while Cortland apples had the lowest . Rome Beauty apples also had the highest flavonoid content while Cortland apples had the lowest. However, Idared contained much higher anthocyanins than any of the other varieties . Anthocyanins are the antioxidant compounds in the fruits that may give fruit a red or blue color. Out of 10 varieties commonly consumed in the US, Fuji apples had the highest total phenolic and total flavonoid compounds (Figures 3 and 4). Red Delicious apples were also quite high, and the apples containing the lowest amounts of phenolics and flavonoids were the Empire apples and the NY647 apple. Antioxidant activity of apples also differs between different varieties, and was positively associated with the level of total phenolic content. The apple varieties with the higher phenolics tended to have higher antioxidant activity. 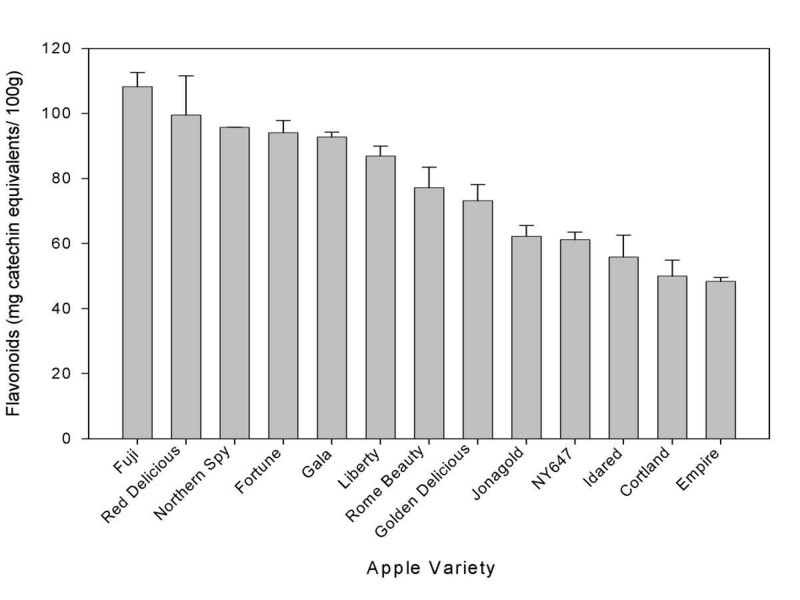 Total phenolic content of apple varieties (mean ± SD, n = 3). 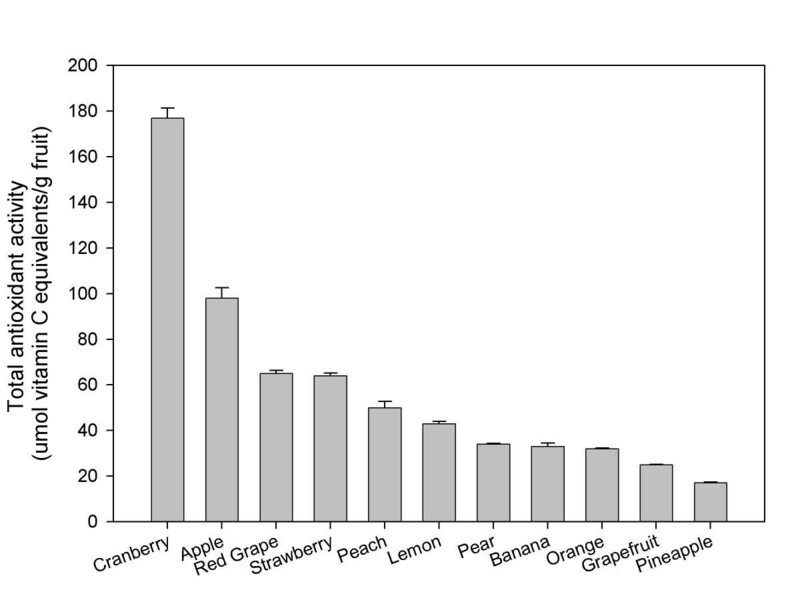 Total flavonoid content of apple varieties (mean ± SD, n = 3). Researchers have found similar variations in phytochemical content between different cultivars of apples. Van der Sluis et al (2001) found that Jonagold apples contained the highest concentration of quercetin glycosides, catechins, and chlorogenic acid when compared to Golden Delicious, Cox's Orange, and Elstar apples. Golden Delicious had the second highest concentration, while Cox's Orange and Elstar had the lowest concentrations . Escarpa and Gonzalez (1998) found that Golden Delicious had the lowest concentration of flavonoids when compared to Reinata, Red Delicious, and Granny Smith apples. Reinata had the highest level of flavonoids, followed by Granny Smith and Red Delicious varieties. Another group looked solely at procyanidin content of four varieties of apples and found that Granny Smith and Red Delicious had the highest procyanidins while McIntosh and Golden Delicious had the lowest . Besides variety of apple, factors such as development and ripening of the fruits may impact phytochemical profiles in apples. Quercetin glycosides, phloridzin, catechins, and chlorogenic acid concentrations in Jonagold and Elstar apples were highest early in the season, and decreased to a steady level during maturation and ripening . Anthocyanins in Elstar and Jonagold apples started high and decreased in mid-season, but rose rapidly just prior to maturation. Interestingly, this increase in anthocyanin content occurred only in fruits grown in the outer part of the canopy, and not in those grown in the inner part of the canopy. The amounts of quercetin glycosides in both Jonagold and Elstar were also greater in fruit grown in the outer canopy . Awad (2000) also found that sun exposed fruits (both Jonagold and Elstar) had greater levels of anthocyanins and quercetin glycosides when compared to the shaded fruits, giving more evidence that exposure to sunlight affects these two compounds production . In general, it can be concluded that improving light exposure for apples may help increase the production of certain phytochemicals. There was no sunlight effect on phloridzin, catechin, and chlorogenic acid. The effect of different nutrients on flavonoids and chlorogenic acid in apples has also been examined. Awad (2002) found that nitrogen fertilization was associated with decreases in anthocyanins, catechins and total flavonoids, and also with decreased percentage of blush in the fruit peels. In Elstar apples, calcium fertilization was associated with an increase in anthocyanins and total flavonoids . They also examined the effects of applications of different chemicals that may enhance ripening on the formation of different phytochemicals. Ethephon increased anthocyanin production, but did not increase chlorogenic acid or any of the other phytochemicals studied. Gibberellins and (s)-trans-2-amino-4-(2-aminoethoxy)-3-butenoic acid hydrochloride (ABG-3168) both decreased anthocyanin production, but did not have an effect on other compounds studied. The application of other chemicals, such as alar, cycocel, seniphos, shikimic acid, plantacur-E and galactose did not have an effect on any of the phytochemicals examined [77, 78]. Apple phytochemical content is not greatly affected by storage. Quercetin glycosides, phloridzin, and anthocyanin content of Jonagold, Golden Delicious, Red Delicious, Elstar, and Cox's Orange apples were not affected by 52 weeks of storage in controlled atmospheric conditions. Chlorogenic acid and total catechins decreased slightly in Jonagold apples. Total catechin concentration decreased slightly in Golden Delicious, but chlorogenic acid concentrations remained stable . After 25 weeks of cold storage, there was no decrease in chlorogenic acid in any variety of apple, but catechin content decreased slightly in Golden Delicious, Elstar, and Cox's Orange apples. Both types of storage had no effect on antioxidant activity in any variety of apple examined. Another group looked specifically at the effects of storage on apple peel phenolics and found that storage at 0°C for 9 months had little effect on phenolic content . Lattanzio et al. (2001) found that after 60 days of cold storage the concentration of total phenolics in the skin of Golden Delicious apples increased. After 100 days, the total phenolics in the skin began to decrease, but even after 200 days in storage, the total phenolics were similar to those at the time of harvest . Processing of apples has been found to affect phytochemical content. Apple juice obtained from Jonagold apples by pulping and straight pressing had 10% of the antioxidant activity of fresh apples, while juice obtained after pulp enzyming had only 3% of antioxidant activity. After pulp enzyming, the juice contained 31% less phloridzin, 44% less chlorogenic acid, and 58% less catechin. Most of the compounds remained in the apple pomace . Similarly, Guyot et al. (2003) found that 42% of total phenolics were extracted in the juice, leaving over half the total phenolics in the apple pomace. They found that hydroxycinnamic acids and dihydrochalcones showed the greatest extraction yields in the juice, 65% and 80 % respectively. Procyanidins had the lowest yield in the juice (32%) . Apple phenolics, especially procyanidins, have been found to bind with cell wall material, which could lead to the decreased levels of polyphenols found in apple juices . Apple pomace is a major waste product accumulated mainly during apple juice processing. Phloridzin, chlorogenic acid, epicatechin, and quercetin glucosides have all been isolated from apple pomace . These phenolics isolated from apple pomace have been found to have high antioxidant activity suggesting that apple pomace may have dietary health benefits and commercial use . Millions of pounds of waste apple peels are generated in the production of applesauce and canned apples in New York State each year. Since apple peels contain a majority of the antioxidants when compared to the flesh , apple peels have the potential to be a value-added ingredient in food products. Apple peels were blanched and then dried under a variety of conditions (oven dried at a range of temperatures between 40° and 80°, air dried, or freeze dried). The freeze-dried samples had the greatest total phenolic and flavonoid content, and the total phenolic and flavonoid was actually greater than in the fresh peels. The apple peel powder had strong antioxidant activity and also greatly inhibited cancer cell proliferation . In numerous epidemiological studies, apples have been associated with a decreased risk of chronic diseases such as cardiovascular disease, cancer, and asthma. In vitro and animal studies have demonstrated that apples have high antioxidant activity, can inhibit cancer cell proliferation, decrease lipid oxidation, and lower cholesterol, potentially explaining their role in reducing risk of chronic disease. Apples contain a wide variety of phytochemicals, many of which have been found to have strong antioxidant activity and anticancer activity. The interaction of the many apple phytochemicals warrants more study as researchers attempt to further explain the mechanism behind the apple's ability to reduce risk of chronic disease. Recent research has shown that apples do contain bioavailable phytochemicals, although more work is needed to better understand the bioavailability of phytochemicals within the apple matrix as opposed to pure phytochemicals. Many factors affect the phytochemical profile of apples, and are important to consider as one attempts to understand and maximize the health benefits of apples. Phytochemical concentrations vary greatly between different cultivars. The level of some phytochemicals varies during maturation of the fruits in response to available light, stage of fruit development and to some types of fertilization. In general, storage of apples does not seem to greatly affect apple phytochemicals, but the processing of apples for juice results in a very significant decrease in phenolics. Processed apple peels retain their phenolic and flavonoid compounds activity and therefore may be used as a value-added ingredient with potent antioxidant activity. The potential health benefits of apples are numerous. Regular consumption of fruits and vegetables, including apples, as part of a healthy diet may aid in the prevention of chronic disease and maintenance of good health.